The Colors Of Indian Cooking: Fast Cooking For Hot Days. Indian Spiced Eggplant With Cilantro. Fast Cooking For Hot Days. Indian Spiced Eggplant With Cilantro. We're moving into the dog days here in Sonoma. Even though we have our burst of heat waves during the Summer months, as it gets closer to Harvest Season in the vineyards, daytime temperatures start to soar. Evenings here are getting crisp and cool but the time of day when most of the cooking is getting done still can be too hot to handle. So what do the smart ones do when the kitchen is the homes' hot spot and not in a good way? I mean besides going out to eat... we look for things that can be cooked quickly and easily which brings me to eggplant. Growing up in an Italian household and spending the last 25 years cooking Indian food, eggplant is not something I associate with speed. My experience with eggplant usually involves smoking, or soaking or some combination of that but an eggplant dish that can be put on the table with a minimum of fuss and bother and no soaking...???? I'm in. Which brings me to this Indian dish with a modern twist aka The Microwave. I'm not a big "Science Oven" user but I have found lately that they can come in handy when speed is of the essence..as long as there's no metal involved. This handy device makes this dish one of those straight from garden to table in 30 minutes or less miracles. I went to the garden an got myself a coupe of Japanese eggplants. us an HD 12 model. 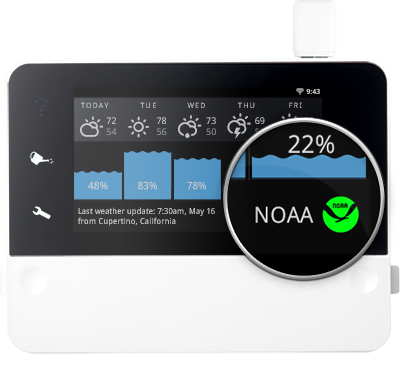 This nifty device works with one's drip irrigation system (a must in California drought country) and connects with NOAA via WiFi every 6 minutes to deliver the most accurate weather information available. Thus, it saves water by automatically tailoring water flow in real time to weather conditions. When we bought our house we made it as environmentally efficient as possible, meeting CalGreen standards for energy and water use. We took out all lawns and xeriscaped with drought tolerant plants, We have a drip system for our property and our vegetable growing beds. So when we received this device we were pretty excited. 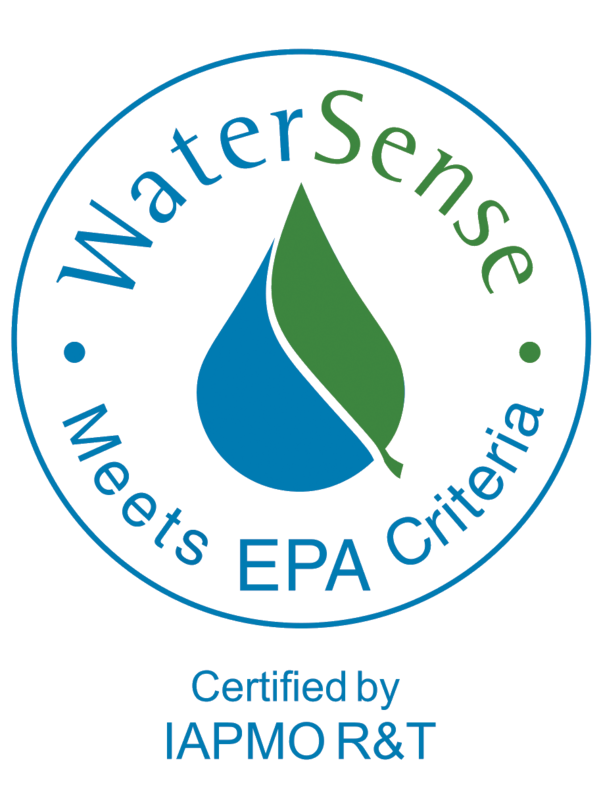 We haven't installed it yet because we still have to set the baseline for our vegetables and fruit but we are pretty stoked to try this thing out as anything we can do to save water, we will. Anyway, I think the eggplants are going to like it! Meanwhile back to the recipe. Wash and cut your eggplants on the diagonal, no soaking or salting necessary. Place the eggplant slices in a microwaveable dish, cover it, and pop them in your science oven for about 4 minutes. While they're cooking, chop the shallot. Place the fneugreek seeds in a mortar and coarsely crush them. Finely chop the serrano chilies. Meanwhile heat 2 Tbs of oil in a skillet or khadi. When the oil is hot toss in the shallot, fenugreek, cumin, mustard seeds, and chilies. The spices, chili, and shallot will sizzle when they hit the hot oil. Add in the curry leaves if you have them, mint, coriander, salt, and turmeric. Saute them for about 30 seconds then add in your cooked eggplant. Cook with the spices, mixing everything well for about 2 minutes, then place a lid on things, turn down the heat and cook for another 5 minutes or so until the eggplant is tender. Chop it up and sprinkle it over the dish. Mix in the mango powder or lemon juice and serve it up. They have a whole kingdom of clay over there! 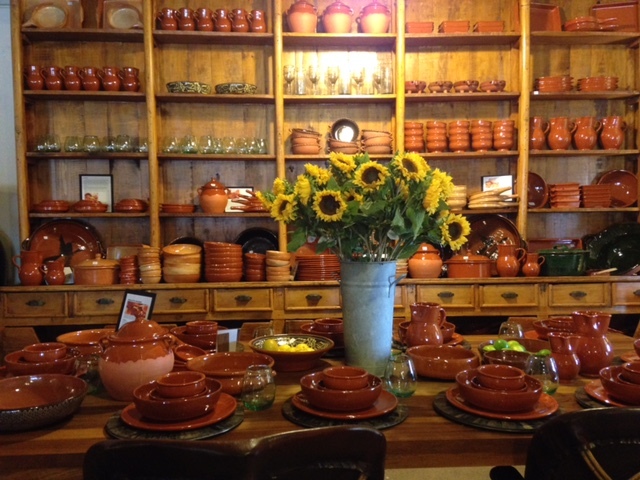 So if you're in Sonoma you're likely going to find me in there at some point in the day fondling pots.